The more you try to go into detail the more your logic tries to stops you from making a mess so I'll leave it here and let people fantasize it on their own. 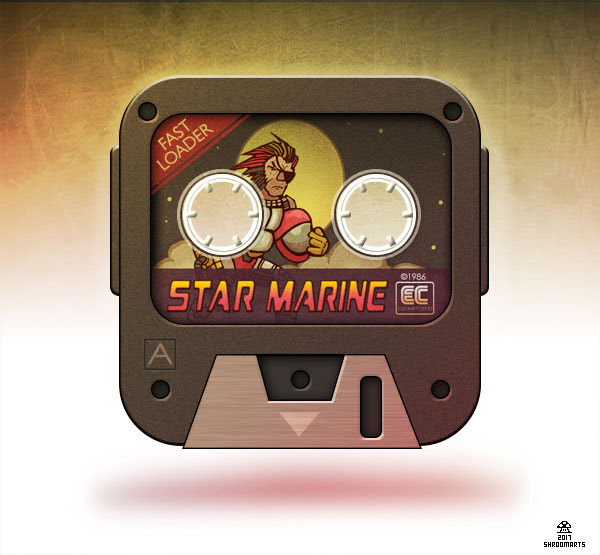 C64 games had a variety of covers, ranging from awesome to real goofy so I slapped a quick, goofy game art of a space pirate, marine sort of thing and picked a silly name (apparently silly names or horrendous translations were a must back then). I cleaned up the sketch, now it looks slightly believable. However I don't like the reel holes eating up most of the artwork yet I want them to be clearly visible as they are the ones that give the cassette feel. Without them what's the difference between a regular floppy? Obviously it would also need the holes for the cassette player's heads to pass through. Maybe a cheap plastic cover would do the trick. It would also stop dust and your neighbours spoiled brat from putting his dirty fingers inside the holes and spinning the reels, spoiling your tape. As the reels are blocked you would obviously need to take off the cover before you place it inside the tape . 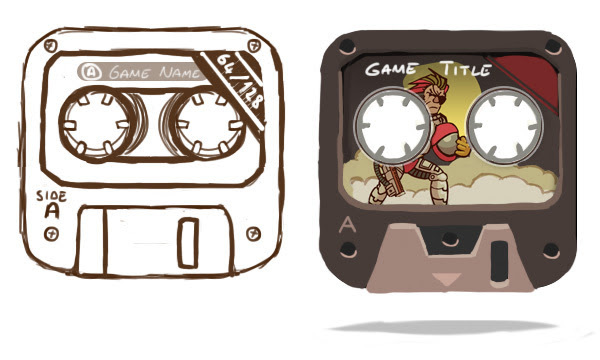 Something like a clip which you squeeze the side part to release the game disk or maybe something even more simple, all you would do is to pull it to the side to release. 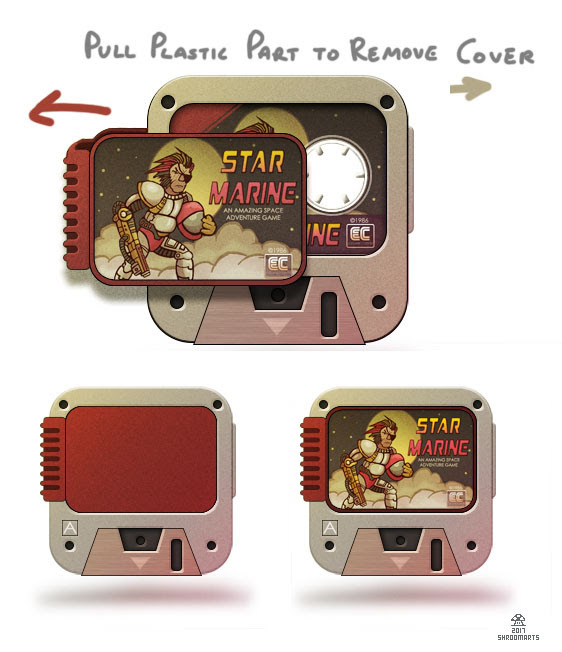 The artwork could be glued to the plastic or it could have a transparent sleeve (as in sega master system game boxes) so you could change the inlay image by simply removing it out of the sleeve. Eventually you would need a device to read these things so maybe I should come up with something similar to a C64 datasette or something.